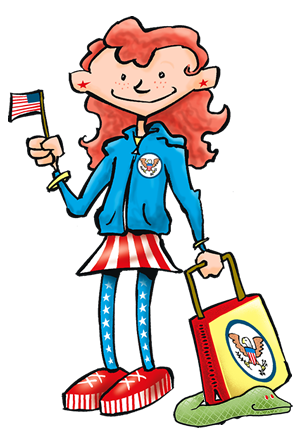 Hi, I’m Mary America, first girl President of the United States! I am so smart that I skipped many grades and was admitted to college at age 11. I love solving hard problems! My favorite foods are waffles and PB&J. I have a pet snake… I know… weird, right? I love to laugh, because my life is so serious most of the time. I always check my shoes twice when I get up from my desk, because my pesky little brother likes to tie my laces together, making me trip - I don’t like tripping! I have great friends, a crazy, but awesome, family, and a staff that helps make my life easier. Lets face it, being 12 and being the President is NOT easy! I want to hear from you!! Click HERE to email me. Click HERE to watch the video I made, just for YOU!